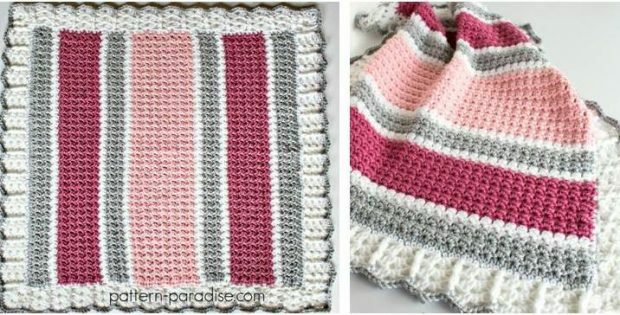 This simple yet pretty crocheted baby blanket will definitely add charm to your little one’s space. The soft and cheery tones will keep your baby comfy and warm. It also makes for an excellent present to bring to baby showers. In fact, experienced beginners and intermediate crocheters will definitely find this pattern fun and easy to make. Once finished, the crocheted baby blanket should be approximately 36 inches by 36 inches in size. In metric units, the completed crochet blanket should measure about 91 cm by 91 cm. This lovely crocheted baby blanket is a design by Maria Bittner. In fact, you can access the FREE pattern for this pretty crocheted blanket from her website. Featured image: Pattern Paradise – thank you!